And Brian & Erika make it as the 10th team. Garrett & Jessica are 11th and done. Phil: Brian/Ericka, you're team #10. Phil: Garrett/Jessica, this is the end of your Amazing Race. You're the last team to arrive. You've been eliminated from the Race. Phil: Does he get angry like this all the time? G conf: I am looking for someone who can keep a cool head and make it through life's crises. Are we closer to marriage? Dunno. Leg 2 definitely better than Leg 1. I'm now in Amazing Race mode! So the task which occur in the past leg is the duck one since TAR 5 detour used it?? And it made me crave for Pho! Agree 100%. But because Leg 1 was SO different, it was cool to watch. And I think a detour might've been edited out of Leg 2. Agree 100%. But because Leg 1 was SO different, it was cool to watch. Though I think a detour might've been edited out. Leg 1 was sooooo bad..
Leg 2 was nice!! But no detour.. I felt that the first two legs were abrupt. IDK if it's the lack of commercials here in our place or because the legs were really speedy. OOPS! A dropped giraffe lies broken on the street! Phil: ... and Lance unleashes. Sitting in the street, Lance smashes a radio and rips out the innards. Maybe. But YAY at the Vietnam buses! They should've had them go somewhere far though. Like Hue? And this season is COMPLETELY different from what I expected. LOVE, LOVE, LOVE it! Even the parts I think I'd hate! My Father now likes TAR because of this eppy! Yes, he did say a RB...also all the press called it a RB. Only one person the team was allowed to perform the task, plus yes, Phil did mention it was a Roadblock. Did you notice how they never showed the teams actually walking down the ramp at the end of the tunnel (LA River). It was really slick there. I'm reviewing to see who has wet pants at the startline. OH WOW!!!! I'm really excited, annoyed, unhappy, frantic, clueless, and oddly giddy right now!!! That was the WEIRDEST premiere I have ever seen. I kind of liked it, but Leg 1 had WAY too much emphasis on Maria & Tiffany. And they pulled an Anthony & Stephanie edit for poor Garrett & Jessica. I'm so sad about who was eliminated, but I'm happy that Garrett & Jessica are going to be married! The starting line elim was waaaaayyyy unfair, regardless of which team came in last. Lance & Keri: In the first episode he seemed really harsh, but then Leg 2 came and he calmed down. Either that or ALL the other teams except Gary & Matt really got crazy! This team is okay to me, but I don't really like them. I just want to see what they will do next. Maria & Tiffany: They blaaaahhhhhd me out of my mind with their cluelessness. I was expecting much more strength from them. We will have to see how in the world they will go farther. They are my least favorite team right now. Eric & Lisa (12th Place): They did their best, showed class, and definitely took their elimination the right way. The other teams should be bowing down to them for their unintended but well-accepted sacrifice. It's sad that it had to be them. Herbert & Nathaniel: HATE HATE HATE their nicknames being on screen. How very lame. I'm going to blame the new producer they listed in the credits. But as a team they are great and run at a nice, relaxed but quietly competitive pace. Enjoying watching them! Gary & Matt: One of the best teams right now, mainly because they are not overbearing. I enjoy that they are the calm team in this maze of crazy, out of control people. This season may very well top TAR 6 as the most frenetic, argumentative race ever. The father and son are great, and I can't wait to get to know them better. Zev & Justin: LOVE THEM! They are always witty, constantly adjusting well to the race, and I was very happy to see the interaction with the guy who needed a coat. And best of all: The whole race isn't being made to be all about them, which makes them much more likeable. Garrett & Jessica (11th Place): I was sad to see them go. I didn't like them much after the two episodes, but at Elimination Station they were great! I know they had potential, and they smoked the "Detour" in the second leg. Too bad they never got a chance to catch fire. Too bad we couldn't see them at ALL in Leg 1. C'mon, CBS! Marcy & Ron: Thoroughly enjoyed them, love how competitive they are, because they would have been toast on Leg 2 otherwise. Really impressed me and I can't wait to watch them more! Mika & Canaan: Didn't enjoy them as much as I thought they would, but I still greatly respect them for the love and respect they have for each other. I hope they go faster, or they will be out next leg! I'm also scared that they might become an emotional trainwreck. Let's hope that doesn't happen. Sam & Daniel: They were another team that I enjoyed more than I thought I would. I'm impressed with the way they raced and find it funny that they are turning Maria & Tiffany's strategy right on its head. I'm a fan! Meghan & Cheyne: I liked this team more than I thought I would. They are going to be the dominant team of the race, in my mind at least. As long as they don't suffer a fate like that of Amanda & Kris. I also hope they don't start bickering. We have enough contention this season as it is! Brian & Ericka: Spirited and totally enjoying the experience. This team is awesome. They had 3 or maybe even 4 close calls in the first two legs alone. But they never gave up. I am glad that they made it. After all that suffering in the back, they deserved to survive at least one or two more legs. Congrats to them! So, all in all, not the greatest premiere. It would have been much better if the pace had been more relaxed and there had been some breathing room. And less emphasis on the poker players, please. 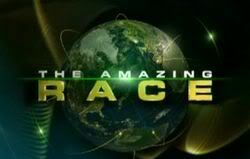 The Amazing Race is NOT about celebrities. Actually, love this season's cast. Not too nicey-nice (ala TAR 14) yet not too cutthroat-ish (ala TAR 13). Sure, there are some mehs, but it's inevitable. Plus, put the mehs in another cast, they'd prob. be my faves.